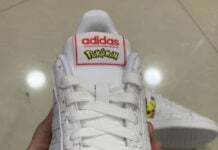 After yesturday’s teaser image, the Hanon x adidas Consortium CNTR finally gets an official unveiling. 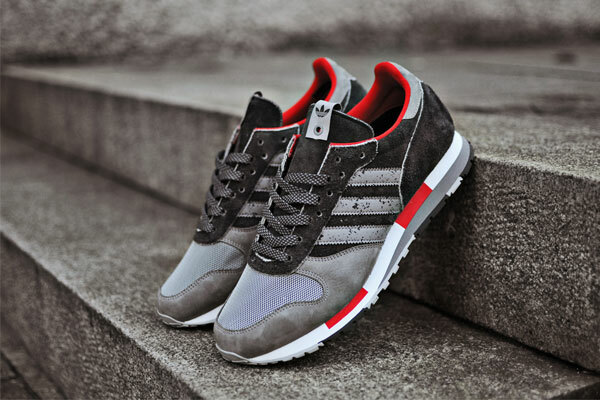 This January we are proud to present a brand new project with adidas Originals. Our latest collaboration focuses on the adidas Centaur – an archive running shoe brought back for the first time since its inception in 1984. For this release we pay tribute to our hometown of Aberdeen – The Granite City! Both the colour way and material application are inspired by our surroundings which were historically built from locally quarried granite. A town of two faces, in the winter Aberdeen can feel quite bleak, whilst in summer the buildings come alive and evoke a silver sparkle that gives the architecture of the city its unique charm and character. Executed in suede, mesh and nubuck, the grey upper of the Centaur depicts the seasonal change of Aberdeen’s landscape. 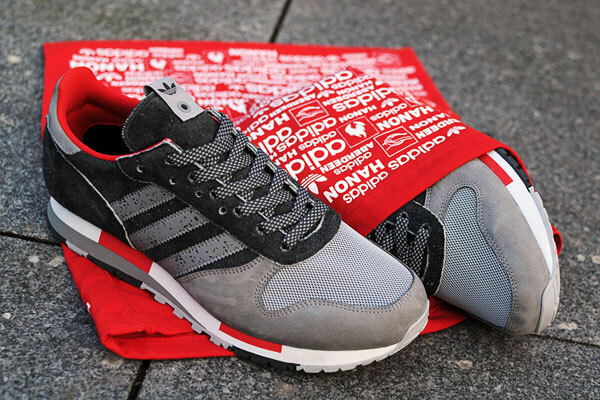 At the rear of the shoe there is a dark grey suede with a heavy nap representing the gloom of winter which is offset by a dual layered silver mesh and light grey nubuck that leans towards the fairer months of the year. 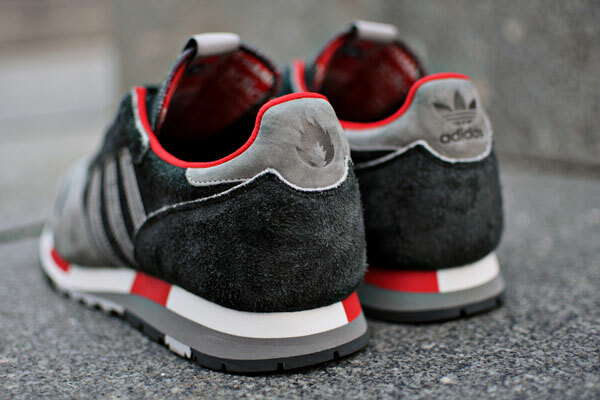 Additional features appear by way of Aberdeen’s red accents, ‘granite’ three stripes and multi print sock liner. 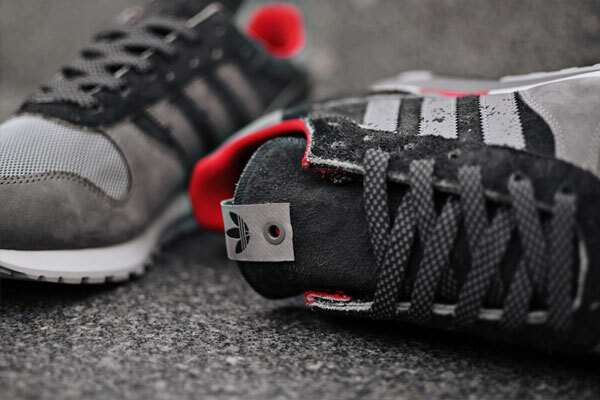 The detail on the stripes was created by applying a mirror image print of the grain on the stonework at our warehouse to a black 3M reflective material, while the footbed and tongue backer draws inspiration from adidas’ archive boxes and tissue paper. Further detail on the shoe appears in the form of dual branding via debossed heel tabs and embroidered Consortium tongue pulls. 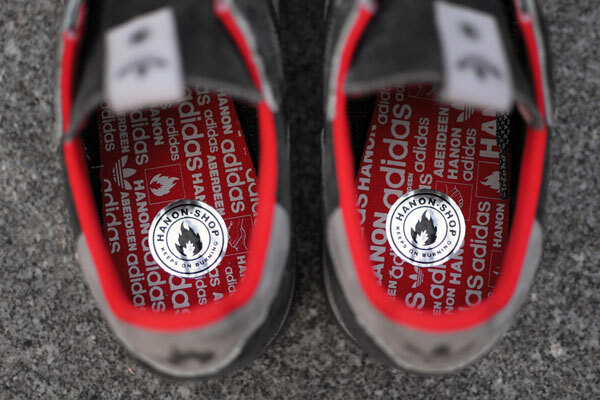 The hanon flame appears on the left shoe whilst the classic adidas Trefoil is applied on the right. 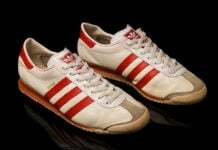 Finally, each hanon Centaur comes with silver foil footbed labels, three sets of laces – one tonal, one contrast and one with a reflective weave. A special edition dust bag will be available with a number of pairs for the launch of the Centaur and to mark the collaboration, a limited edition ‘granite’ tshirt will be released in store only. 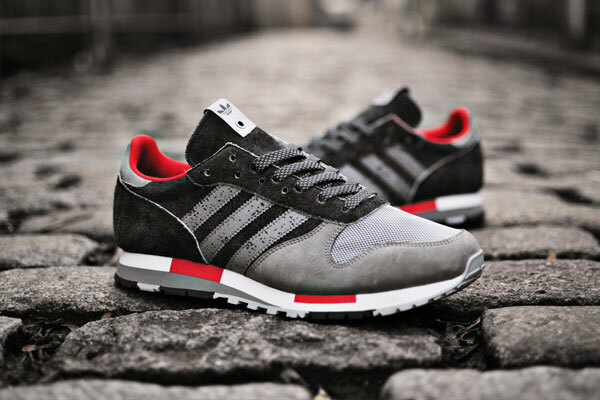 The adidas Consortium x hanon CNTR will be released at Hanon, Aberdeen, hanon-shop.com, No.6 London and No.74 Berlin on January 26th 2013. 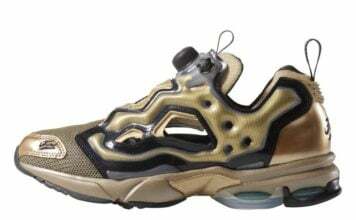 From February 2nd the pack will be available at selected Consortium stockists.